It can be exciting, or daunting, some of you would say, to select the paint finishes for the exterior of your new home but the practical bits like roofs, gutters and facias are sometimes not given a lot of thought or attention. Often clients look at me with a blank and worried stare when I mention the facia. 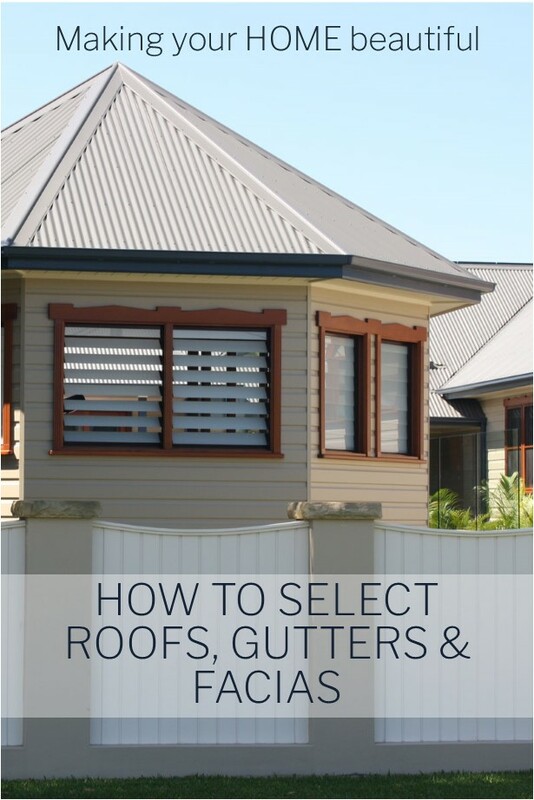 So this post on how to select roofs, gutters and facias may sound a little uninspiring but for those of you who are building, I hope it helps to make some sense of these very important choices. What colour should my roof be? Consider the style of your house. Is it a traditional home in the city or in the leafy suburbs. If this is the case then you may feel you want to opt for a classic grey shingle style roof or a traditional terracotta one. This look is solid, timeless and suits the classic style family brick home. However if you are building a coastal style home you will be more likely to opt for a laid back look and build with a metal Colorbond roof. 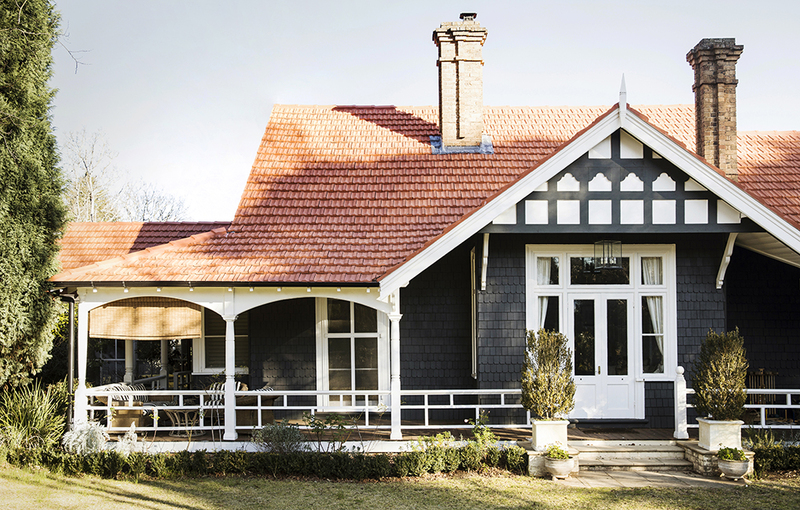 Country style homes too suit a metal roof – so typical of the classic Australian country home with its Zincalume roof. 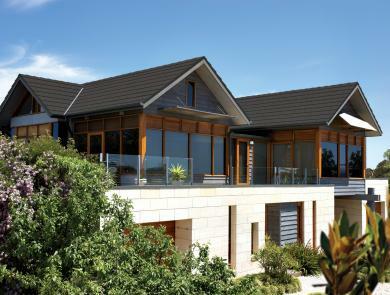 A contemporary home with a skillion style roof also needs a metal roof. Consider whether you want to see a contrast? Do you want to see a contrast between your roof and your house? Would you prefer the roof to just blend in to the surroundings or do you want it to become part of the colour scheme and stand out? A traditional terracotta roof makes a statement and there is many a gorgeous home in Sydney and the surrounds with this style of roof. It doesn’t mean that you have to continue with that colour throughout the scheme – the roof just makes the statement in its own right. What you do see though is a very definite contrast. Consider the colour scheme. The prevalence of Colorbond roofs has meant that many of us now have to give a lot of thought to the colour of our roof as in many cases it becomes a definite part of the colour scheme. It is very challenging just viewing the colour from a small chip and I always recommend that clients go to a roofing supplier to see large samples of the metal in the sunlight. Remember that grey washes out of the colour in the direct sun and you will see more of the underlying colour beneath. Consider the desired temperature of your home. Light coloured roofs will reflect the heat and dark coloured roofs will absorb it. You generally see darker roofs in areas like Melbourne and lighter roofs up in the heat of Queensland. Will you be installing banks of solar panels? If you are planning to invest in a large amount of solar panels then you should probably opt for a slightly darker roof so that these are disguised. You may have a style of roof with the west or north facing side away from the street in which case you might be able to get away with solar panels and a light roof but a roof on full display from the street with solar panels can detract from the overall look of the house. I love the house above and this is a great example of how you can have a traditional terracotta roof which makes a statement and stands out but the house doesn’t have to contain that colour. By adding a black gutter and white facia you create a good break to lead into the rest of the house which has a very contemporary colour treatment. I find that many of the Colorbond roof colours look very similar in situ and it is not until you see the guttering that you can always pick which colour the roof is. Early in the morning or late in the afternoon, can be easier to see but when the sun is high many all look the same. Therefore you need to focus on the depth of colour that you want first and foremost. The appeal of using Colorbond for your roofs, gutters and facias is that you do not have to worry about colour matching. If clients are looking for a dark roof I often steer them towards Colorbond Monument as this is a very neutral off black with no obvious underlying colour. 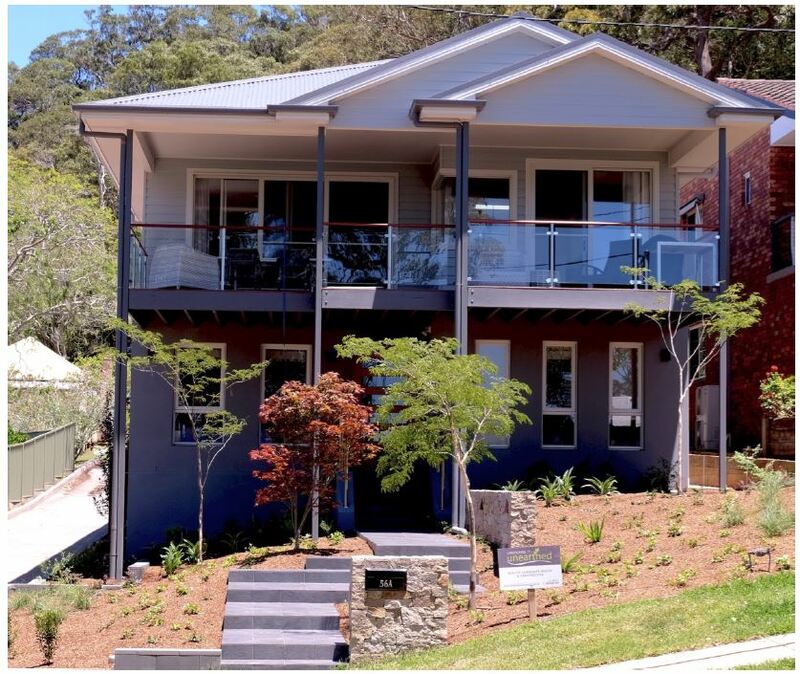 Colorbond Woodland Grey is a time honoured classic which has looked good for years – in fact it replaced Colorbond Slate which was a very similar grey and I have been using both for almost 20 years. It is one of the only Colorbond colours that has always been popular. Woodland Grey does have a green undertone. I find this very easy to work with and a favourite for exterior schemes. It is certainly one of my favourite roof colours. Colorbond Ironstone has a blue undertone. I like it but sometimes I wish it was more of a charcoal blue – I feel it just needs to be a touch greyer as in some lights the underlying blue can really show through. A mid tone Colorbond colour is a good idea as it gets neither too hot or too cold. Dark enough that it won’t show the dirt and leaf litter stains as much as the lighter colours but not too dark that it becomes hot in the summer. Colorbond Basalt is a lovely neutral mid-tone grey which I like to specify. It does have a slight blue undertone but I find that it goes with many colour schemes and gives a classic look. Good for traditional homes where the client wants a slightly lighter colour and great for contemporary homes too. Colorbond Wallaby is another great mid-tone colour with a gorgeous warm brown grey undertone. In fact, just like a Wallaby! A great choice if you prefer the warmer greys and neutrals. Colorbond Gully is a fabulous neutral if you prefer a colour that leans more towards earthy browns and away from the greys. Outside it can look like a nothing colour, if that makes sense. It is simple and goes well with many neutrals. I actually love this colour matched in a paint finish too for exteriors – not at the height of fashion but will look good for years to come. Lighter Colorbond roofs are very popular, particularly in coastal locations as you get a light and airy look. Excellent to use in hotter climates and very popular in Queensland as the light colours reflect the heat. Do consider though if you have overhanging trees – particularly if they are gum trees. Leaf litter quickly builds up and stains lighter roofs and they can be difficult to maintain. For this reason, Colorbond Windspray is a favourite of mine as it gives you a light, silvery look but just has a bit more depth than the other lighter colours. In some lights it appears a little blue and in others it appears green. On the roof it looks predominantly silver grey. Colorbond Dune is another great classic. A warm grey, this is an excellent choice to go with a warm earthy colour palette. It can be slightly pinkish in some lights but you don’t usually see this when it is on the roof – you generally only notice this in the guttering. Colorbond Shale Grey along with Woodland Grey is another colour that has endured. It replaced Gull Grey and is just that classic cool neutral silver grey that has been popular in roofing for a very long time. It can give you the look of the old Zincalume roofs and is an excellent choice for coastal and country houses. Colorbond Surfmist is a favourite of many. Clients love it in coastal locations and it certainly does give you a very light and reflective roof. I have had many comments though from clients who don’t like it as a guttering colour. It does appear a little creamy. I think in many cases it works well as the depth of colour and grey in it work well in the sunlight. However for those people who use it for facias in Hamptons styles where they also add a lot of very crisp white trim, they feel it looks dirty in comparison. In this case I usually specify a timber facia that can be painted. Note that the amount of underlying colour that you see in any of these colours will depend on the time of day, the aspect and degree of the pitch of the roof and how much flashing you see. Ensure you look at large samples of the metal and ask the supplier for examples of houses which have the colour you are interested in – this is the best way to see if the colour is right for you. The house above has a Shale Grey Colorbond roof and gutters with Surfmist facia. 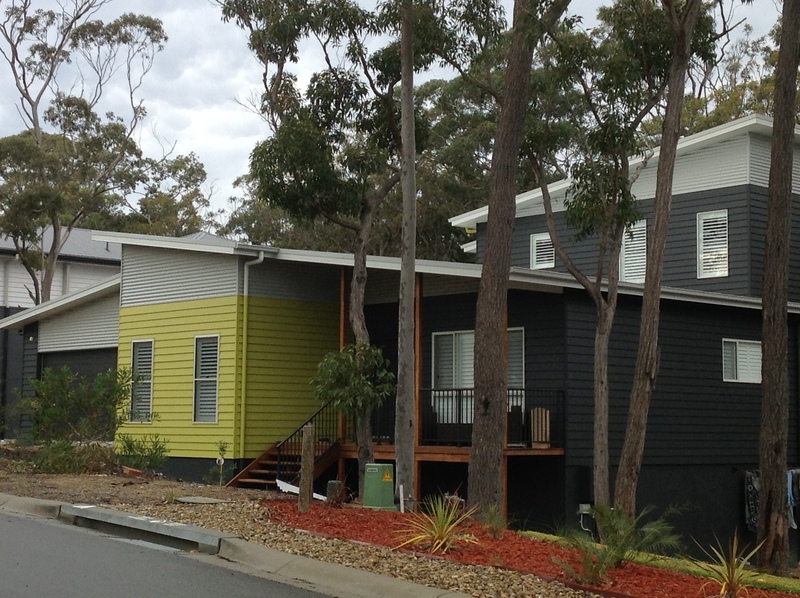 There is also Colorbond walling in Shale Grey with a Monument garage. 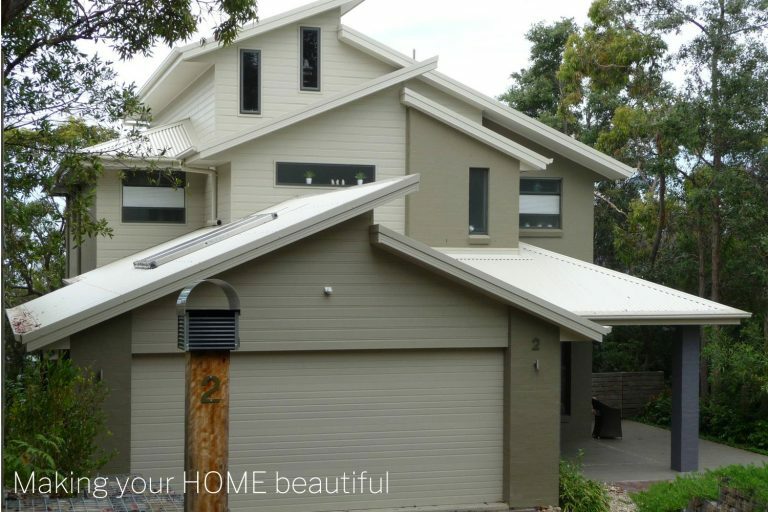 This house has a Colorbond Dune roof, gutter, facia and garage. You can see how you can tell which colour the roof is from the flashing rather than the actual ribbed metal roofing. This house has a Basalt roof and gutter with a Surfmist facia. It is interesting to note how light the roof appears in relation to the guttering but in fact they are the same colour. My favourite concrete roof is the flat shingle style as this gives you a streamlined and very classic look. The dark greys have a look of traditional slate which works well. Note though that for most types the colour is painted on the top of the roof tile and over time this will fade and chip. The premium concrete roof tiles have colour all they way through but are generally just in dark charcoal grey and of course will also cost more. 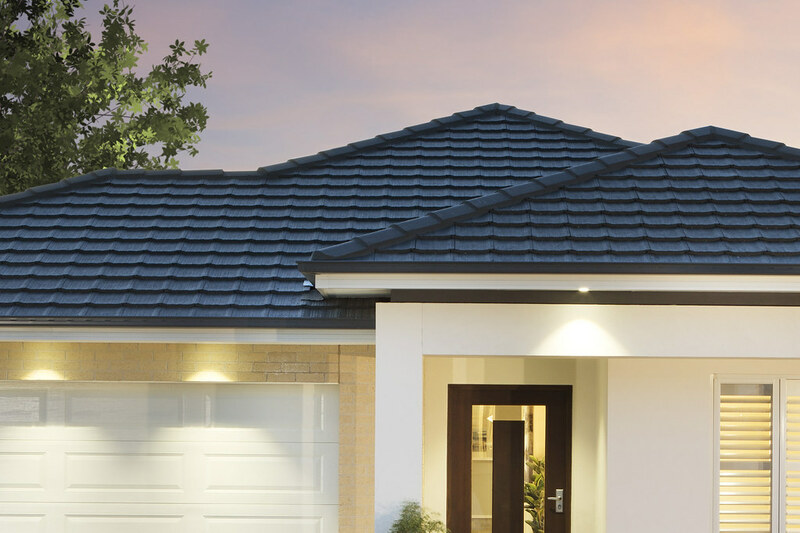 The image below shows Boral’s premium Linea Charcoal Grey colour through roof tile. A terracotta roof is the best quality and it doesn’t have to be a terracotta colour! Although I love the traditional Terracotta coloured roofs, it is actually the terracotta itself which makes the tile amongst the best and they do come in a range of colours. With long warranties this really is a premium product and is particularly good for harsh environments. 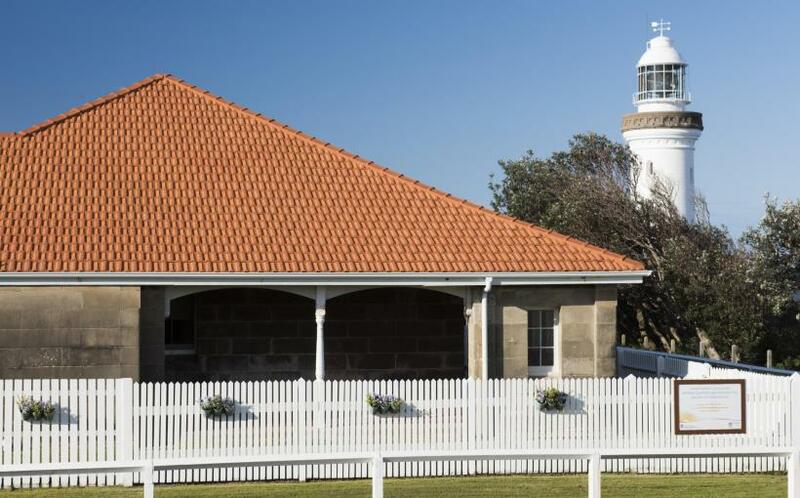 Boral has recently used their French terracotta roof tiles on the restoration of the Norah Head Lighthouse. A project close to my heart as this is close to where I live and an absolutely gorgeous place to visit. It is a testament to the product that it has been installed in such harsh conditions. Gutter and facia the same colour but as a contrast to the roof. Option 1 will give you a seamless look and is often considered the most contemporary of choices. This brings the colour of the roof down into the scheme. 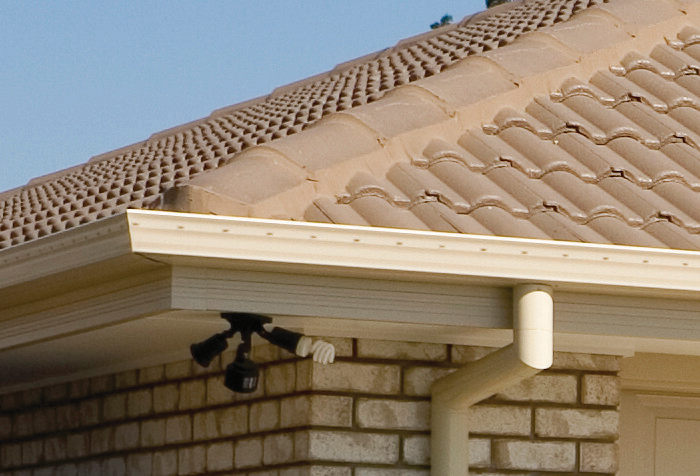 The image below shows a house with Colorbond Evening Haze roof, gutter and facia. Option 2 makes the gutters disappear into the roof and the facia stands out more. This can be very effective if you have a white facia and lessens the impact of the roof and gutter. Option 3 gives you a very dominant trim colour. For example if the roof is a darker colour but you didn’t want to make this a feature of the house you could add a lighter gutter and facia which becomes a wide band of trim around the top of the house. The image below demonstrates this but if you go back up to the Norah Head homestead restoration project above you will see a good example of this there too. The roof in the image below is surprisingly Colorbond Woodland Grey and this demonstrates how light roofing can appear at different points of the day. 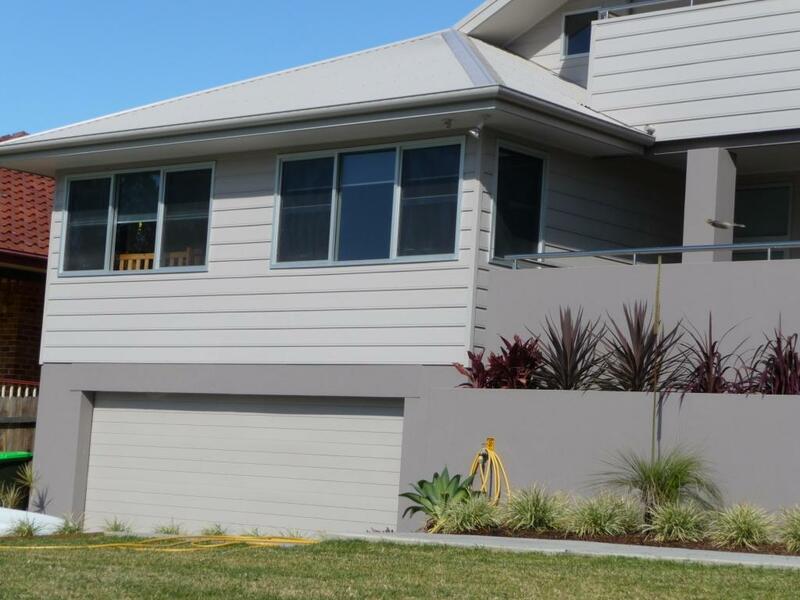 A contrasting Deep Ocean gutter and facia has made a definite colour statement on the trim of the house. The options are vast for your choice of roofing and the way that you treat your gutters and facia will have an impact on the overall look of the house. So when selecting roofs, gutters and facias bear in mind your location, including the year round temperature, the style of your house, the colour scheme and whether or not you want the roof and trim to stand out or to blend into the house. If you are building or renovating I have a handy comprehensive exterior checklist which you can use to ensure you have everything covered. You can download it free from my Resource Library. This will get you started with choosing roofs, gutters & facias and the many other products, finishes and colours that you need to select. Sign up free for it here.